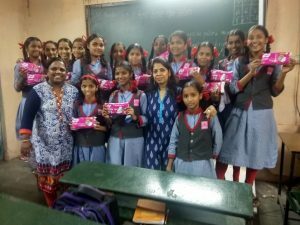 As access to sanitary napkins is essential for a safe period, an awareness session on menstrual health and hygiene was organized for 17 adolescent girls in Samta Vidymandir School . Programme officers interacted with students, highlighting the importance of using sanitary napkins during periods. Sanitary napkins were distributed to all beneficiaries during the session. Topics such as stigma related to periods, the menstrual cycle, and menstrual waste management were discussed. Additionally, the adolescent cycle of growth was also explained to further break stigma and encourage girls to share their queries on menstruation. Queries raised by beneficiaries were addressed by programme officers. The taboo surrounding periods makes it difficult to openly discuss menstrual health, especially with adolescent girls. Hence, ensuring they are well informed about periods during early adolescence will help prevent illnesses arising from unsafe management of periods. Previous PostPreschool Centre at Aarey Colony – A Success Story!